Fouquieria columnaris. Photo by Josiah. And never be met with again!" Congratulations to Pat who identified the subject of the above photo right off the bat as Fouquieria columnaris (or Idria columnaris), a desert plant of southwest North America commonly known as the cirio (Spanish for 'candle') or boojum tree. The name 'boojum' comes from Lewis Carroll's allegorical* poem The Hunting of the Snark in which a company of mismatched adventurers attempts to capture a mysterious (and possibly non-existent) creature only to have one of their party disappear under puzzling circumstances. *Many authors refer to The Hunting of the Snark as allegorical. 'Allegorical' may be shorthand for 'no, we don't know what he's on about, either'. 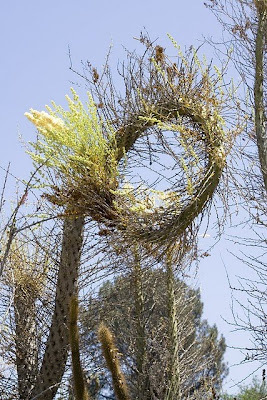 It is not hard to see how Carroll's eerie, creepy boojum became associated with this strange, eerie plant (though, to the best of my knowledge, F. columnaris has never been party to mysterious disappearances). The boojum has a restricted range, found on granite ranges in the Mexican states of Baja California and Sonora. Rainfall in these areas is low, averaging 120 mm per year (Bashan et al., 2007). Boojums can reach heights of up to 12 metres (Humphrey, 1935) but grow slowly, about three or four centimetres in a good year (Bashan et al., 2007). It can take 100 years for a boojum to reach maturity and begin flowering and large individuals may be more than 700 years old. 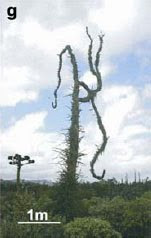 The usual growth form of a boojum is as a single tapering trunk - Pat's description of it as a "living telegraph pole" is appropriate, while Humphrey (1935) regarded it as "not unlike a greatly elongated inverted parsnip". The central stem may or may not divide into candelabra-like branches while individuals may deviate from the usual vertical growth to form strange loops or arches. The central stem is covered by short side branches arranged in a spiral pattern and carrying spines and small leaves. An example of the unusual growth habits adopted by some boojums. From Bashan et al. (2007). The genus Fouquieria includes eleven species of North American succulents that have been placed in their own separate family (the other Fouquieria species, the ocotillos, are low radiating shrubs). Recent studies have placed Fouquieria among the Ericales and most (but not all) molecular analyses support a sister-group relationship between Fouquieria and Polemoniaceae (the phlox family; Geuten et al., 2004). Bashan, Y., T. Khaosaad, B. G. Salazar, J. A. Ocampo, A. Wiemken, F. Oehl & H. Vierheilig. 2007. Mycorrhizal characterization of the boojum tree, Fouquieria columnaris, an endemic ancient tree from the Baja California Peninsula, Mexico. Trees 21: 329-335. Geuten, K., E. Smets, P. Schols, Y.-M. Yuan, S. Janssens, P. Küpfer & N. Pyck. 2004. Conflicting phylogenies of balsaminoid families and the polytomy in Ericales: combining data in a Bayesian framework. Molecular Phylogenetics and Evolution 31 (2): 711-729. Humphrey, R. R. 1935. A study of Idria columnaris and Fouquieria splendens. American Journal of Botany 22 (2): 184-207. I am not usually competitive but this is my type of game. One where I already know the answer. Though, Christopher, you are so tricky with these I couldn't be sure. Columnar cacti are often called Cirio, derived from the same Latin word for candle given to various spp. - Cereus, hairy candle, southern candle, moon candle, hedgehog candle.